If you’ve read our latest posts, you might get excited about the cool stuff that’s coming in Maia, but wait a minute; there are already lots of great features in IntelliJ IDEA 8.1 that you can touch right now, while looking forward to get the first Maia EAP. I’m talking, for example, about the full Team Foundation Server integration, that is already available. All you need from version control is included. You can perform all common VCS functions like commit, update, revert, show differences and history, automatic check out of modified files, etc. You can create and merge branches, lock and unlock files and view the history of committed and incoming changes, link the existing work items to your changelist. 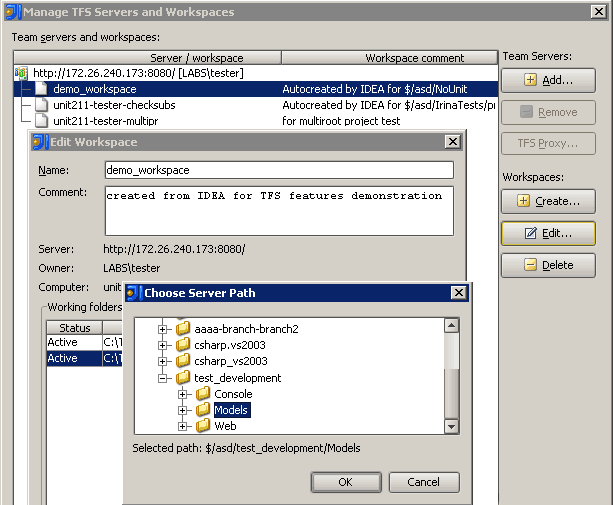 IntelliJ IDEA also lets you create and manage TFS workspaces. But that’s not all. The most remarkable thing is that IntelliJ IDEA’s TFS integration doesn’t require Microsoft’s TFS client installed; furthermore, it works under any OS, not only Windows. This entry was posted in New Features and tagged TFS, VCS. Bookmark the permalink. Does it work only with IntelliJ IDEA Ultimate edition? I cannot connect IntellJ Ultimate 14.1.4 to my TFS Online (a.k.a., unfortuntely misnamed by Microsoft as “Visual Studio Online” instead of what it really is,”TFS Online) using VCS / TFS / Edit Configuration / Add … / Address https://myname.visualstudio.com/DefaultCollection / Auth: (all three fail) /. Is there some *DEFINITIVE* *DETAIL* instructions on how to connect JetBrains products such as IntelliJ Ultimate 14.1.4 to “TFS Online” (a.k.a., Visual Studio Online)?